Ten years ago, back in Austin, I remember laying in my sketchy first apartment in college with my laptop drawn up close to my face. I was squinting at some tiny text on the rabbit hole webpages of the very first Cloverfield ARG (alternate reality game). Ever since I heard that the monster movie was in production, shrouded in secrecy, full of mysteries and clues scattered over the internet. What’s Slush-O? Why are they doing deep sea drilling? Is the monster mutated ocean bacteria?! I was hooked. This of course amplified my excitement for the film even more. I was trying to wrap my brain around the Cloverfield puzzle, and the hype became deafening. When it was finally released though, I was let down. Why? Because the film could never reach the expectations that I had already set in my head, months of anticipation fueling me. And that sucked. It wasn’t until years later that I finally watched the film again and could appreciate it as a fun American monster movie, full of eye popping gags, and one of the best utilization of the found footage aesthetic at the time. We get caught up in the hype train so hard sometimes that we can’t make out the forest for the trees, and it just leads to disappointment. And it keeps happening. Every year, one or two movies come out that gets dragged through the public forum, declared as “the scariest movie ever!”. You know the films: The Conjuring (2013), The Babadook (2014), It Follows (2015), The Witch (2016), and recently Get Out (2017). And with Sundance currently underway in Park City, it was only a matter of time until we started hearing the rumbling for this years contender, and it looks like we have our one: Hereditary. This is by no ways a means of taking away from Aster’s work or the critical eye of those that have already viewed the movie, but while in the short term these hyperbolic declarations will ultimately be good for Hereditary to build word of mouth, I am most afraid of how this will effect the film in the long term. Now remember, we have no way of seeing the film yet. While it is destined for distribution, it’ll be months before we even hear a release date. So that means as audiences we get to sit and muse about the fact that apparently the scariest movie in years is just out there in the ether. This will give our imaginations plenty of time to fill in the blanks for what we think this movie is going to be apart from what it is. Again, we haven’t even seen a clip yet, but the internet is already a-buzz. The hype train has left the station. By critics using this type of language in their headlines, that it’s the most terrifying movie in ages, they already have made the expectations impossibly high. But we can’t blame the critics for reacting the way that they have. 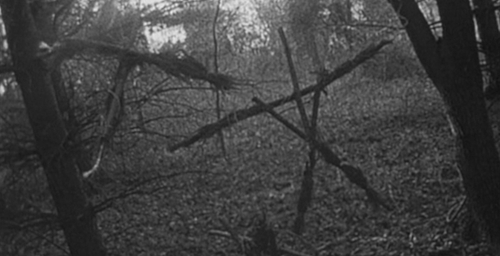 I still cannot fathom what it must have felt like to stumble into Sundance Midnight when The Blair Witch Project debuted. If you strip away everything we know about Blair Witch now and put ourselves in someone elses snowboots in 1999, just imagine! Before found footage was reviled, before the endless parodies and spoofs, there was a movie that absolutely petrified an unsuspective audience. I do not think that the critics are purposefully using hyperbolic language to steer a narrative about the film, they were just blindsided by how effective the film is just like you or I would be. But, keep in mind, for the rest of us that weren’t in that room where it happened...we don’t get to have that experience of walking in blind, having our worlds rocked. Already we will be walking in to this film with expectations, no matter how hard we try to put a kibosh on them. We don’t like to admit it, but we all do. And that’s a problem, because its these expectations that lead us to the inevitable think pieces in six months like “Why Hereditary ISN’T the scariest movie in ages!” or “Is Hereditary really even a horror movie?” The expectations that this early hype has angled for us, I guarantee, will ultimately divide horror and casual audiences alike. All of this is to say, we should be excited about a film like Hereditary and the countless other front runners for “Best Horror of 2018” that will emerge from the festival circuit. But we beg you, we beseech you, we plead with you! Take all of this language with a grain of salt. It may be the “scariest film in ages”, it may not be, but if we expect it to be the movie that our minds are already scripting...we will always be disappointed.